Upon arrival in Mandalay International Airport, you will be greeted and welcome warmly by your guide and driver for your trip to begin. The sightseeing begin with a drive to south of the city Mandalay to Ava- the capital from 14th to 18th centuries. Ava is located at the confluence of The Ayeyarwaddy and Dokhtawaddy (Myitnge) river. It served as capital for more than 500 years until it was abandoned in favour for Amarapura in 1841. When arrive at jetty, take a short ferry ride to cross Myit Nge River to get to the bank of other side where your horse-carriage is waiting. Board on horse cart, passing through local village and farm, visit the old wooden Bagaya Monastery;built on 267 teak posts, and the remains of the Royal Palace and Fort..Then,continue the tour to leaning watch tower, the remain of Bagyidaw’s palace Nanmyint tower- a ninety foot high masonry watch tower. The earth quake of 1838 shook its foundation, toppled the upper part and leaning to one side.Continue to Maha Aungmye Bonzan monastery,built by King Bagyidaw’s Chief Queen Nanmadaw Me Nu which is recorded as the first to be constructed masonry monastery in the Kingdom. – We’ll stop for lunch in Ava before returning to our car. On the way back to Mandalay, stop at Amarapura, meaning ‘City of Immortality’; the last dynasty of Konbaung era. Amarapura served as the royal city for two times under two different kings. No remain of the palace building was seen as most of the palace building were dismantled and moved to Mandalay. First visit a silk weaving workshop and some step of its process, which produces excellent handmade products. After that, continue the tour to U Bein Bridge for a walk along the 200 year-old,longest teak bridge of the world. 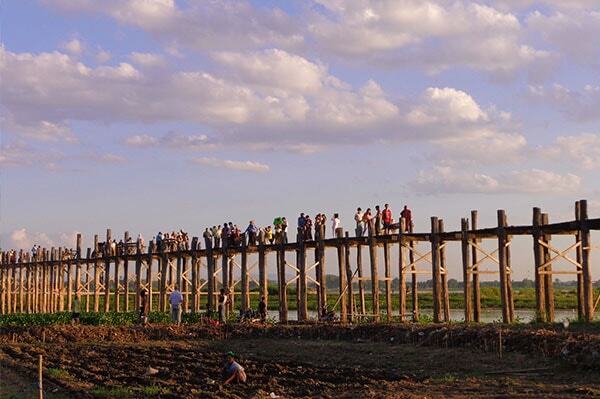 The bridge was constructed of 984 teak wood posts over Taung Thaman Lake;and 1.2 kilometres in length. The vast panorama view of activities in the lake, the bridge itself, the movement of people over the bridge, under the horizontal golden ray of sunlight when the sun begins to dip behind the horizon, is one of the best photo opportunity of Asia. Afterwards, head back to the hotel in Mandalay. After breakfast, your guide will pick you up at the hotel to get started the tour with transfer to 86th street for a walking tour of the surrounding streets. Around that venue you may observe the process step of the precious gem can be found in all forms, from its raw, unpolished state to beautiful handcrafted jewelry by the skillful craftsmen. Continue the sightseeing tour to Mahamuni Pagoda. It is home to the second most revered Buddha images in the country, worship as a living Buddha. The image has been covered with gold leaf over and over again for the years by devotees so that it has attained a unique and iconic ‘lumpy’ texture. Within the precincts, there are six bronze figures, ichnographically belong to Khmer style of art. From here, continue the sightseeing with well-known skilled craftsmanship of traditional workshops, observe the production of wood carvings, stone carving, incite inscription on stone, kalaga tapestries, parasol paper making and gold-leaf making, where the techniques remained unchanged since then the time of Royal Court. This afternoon, continue the tour of Mandalay with a visit to Kuthodaw Pagoda or Maha Lawkamarazein Pagoda whose 729 marble stone slabs of the whole Buddhist scriptures have earned it the title ‘World’s Biggest Book’. This authorized version of Tripitaka approved by the International Fifth Great Synod convened by King Mindon in 1857. Continue visit to grand teak wood building with heavily gilt and adorned with glass mosaic and exquisite wooden carving, depicting the ten former life of lord Buddha Sidhtata. As Shwenandaw Monastery, is the only remaining building from the 19th century Royal Palace, now being under taken by the Archaeological department. 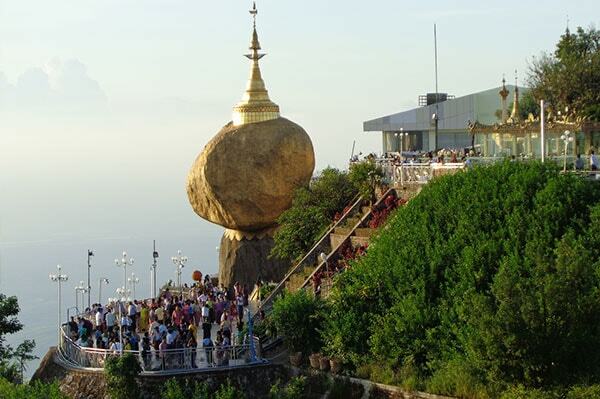 Then head up to top of Mandalay Hill, enjoy magnificent views of the city and Irrawaddy River from the highest vantage point in the area until sun set. After breakfast in the hotel, transfer to Mandalay Airport for a flight to Heho. From Heho airport, a scenic one-hour slightly downhill drive leads to Shwe Nyaung , then to Nyaung Shwe, the gateway village to Inle Lake. Along the way, stop at the wooden Shwe Yan Pyay Monastery of the 19th century which features beautiful carvings and a collection of Buddha images. You may walk around the monastery for observing monastics life. Continue the tour and stop in Nyaung Shwe for a short walk around town and visit to the colourful market, depending on the arrival time and if it is on the 5 day market rotation date. Continue by local trishaw down to the bustling busy canal where farmers by boats from the lake come in for loading or unloading tomatoes and other vegetables for distribution to the markets around the country, from boats to trucks and bikes. Then visit at the ‘tomato house’, a warehouse-like structure where tomatoes are sorted and priced for sale. Then, continue the sightseeing tour along the strand and back to the town centre passing through monasteries and nunneries for monastic life and photo stop. At the canal, board on a private open motorboat to explore into Inle Lake. 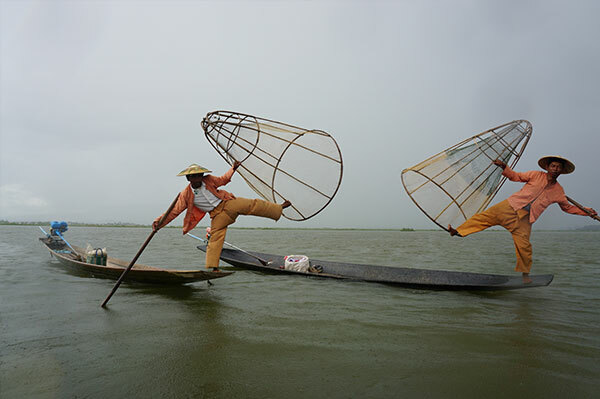 The inhabitants in the lake are known Intha, one of the 135 peoples of Myanmar. Sail and pass through villages built on stilts over the lake, observe the famous leg-rowing fishermen and see their floating gardens built up from strips of water hyacinth and mud and anchored to the bottom with bamboo poles. 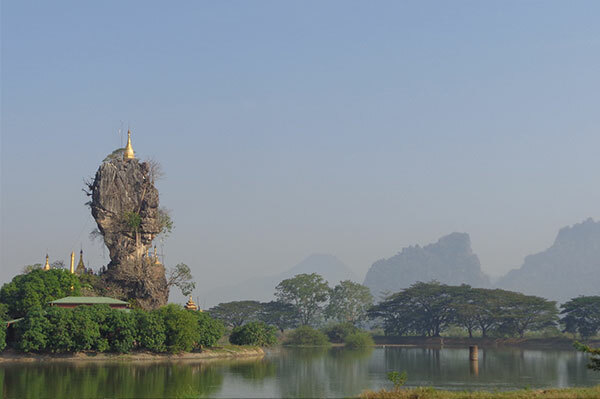 Visit Phaung Daw Oo Pagoda, the lake’s main holiest sanctuary, home to five sacred Buddha images covered in gold leaf. Then return to hotel for your overnight stay. It best to end the tour before 5 P.M.
Distances and journey time:Heho Airport to Nyaung Shwe (28 km): 45 mins. After breakfast in the hotel, visit the lake’s 5 day morning market. The market rotates its location around the lake’s villages in a 5-day rhythm and is visited by lake inhabitants and surrounding hill tribes who come to sell and trade their products. (Note: market closed on dark-moon day and full-moon day). After the tour in Indein,return back to hotel. 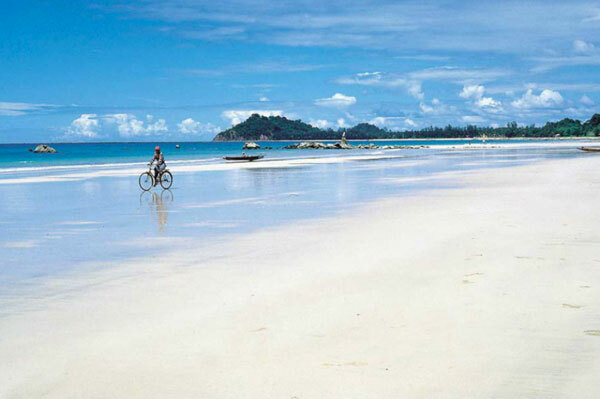 This morning is at your leisure to further explore Nyaung Shwe. Option 1: Bike to wine yard for wine tasting (charges depend on participants)Option2: Book a boat for further tour in the lake (with surcharge). Just after lunch time transfer to Heho Airport for a short flight to Bagan ( 40 min by direct flight). Upon arrival, your car and guide will be waiting to transfer you to your hotel. Bagan was the capital of Myanmar from the 11th to 13th century. During this period, there are 11 kings reigned and constructed thousands of stupas and temples,over 2000 of monuments are still standing today. Bagan located on the eastern bank of Ayayarwaddy River in the dry zone of central Myanmar; is the most important historical and cultural heritage site of the country. After breakfast in the hotel, your journey begins with a visit to the colorful Nyaung Oo Market where the locals come to buy and sell fresh produce and other goods. Then continue to the golden stupa of Shwezigon Pagoda which is built of sand stone of river Irrawaddy. Then, visit Kyansitta Umin- meditation cell with wall painting, Wetkyi-In Gubyaukgyi-a cave temple with exquisite jataka mural paintings, and end the morning tour with a huge elegant Htilominlo Temple- well-known for its fine plaster carvings and glazed sandstone decorations. In the afternoon, begin a tour to traditional lacquerware workshop; observe the skillful and quality production of one of Myanmar’s best-known handicrafts. 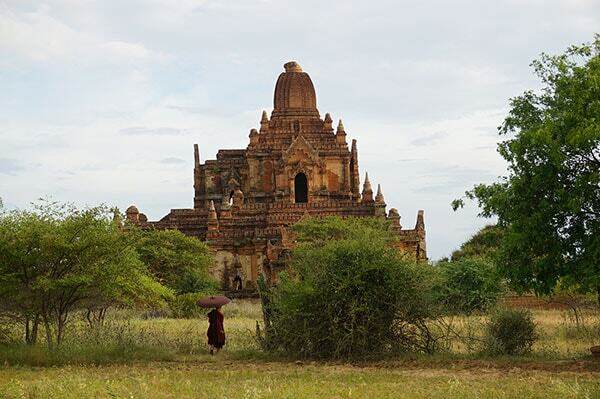 Continue to Ananda Temple, an architectural masterpiece and one of Bagan’s most beautiful temples. The green glazed Jataka plaque in the exterior wall, the lighting system into the face of Buddha from above, the stone carving statue of the niches are most interesting feature of art work. Lunch and back to hotel for avoiding the heat of the day for a while. In the afternoon, board a private river boat and set off upriver toward Kyauk Gu U Min. Throughout your Irrawaddy river cruise you will be treated to fabulous scenes of life on the water: fishermen, local ferry boats, riverside villages and views of the Bagan temples. Continue by boat to Kyauk Gu U Min, from the boat parking to Umin (cave) is about 10 minutes’ walk. At the exterior wall of Kyauk Gu Umin, decorated with beautiful stone carvings depicting religious figures and flowers on the door. Inside the cave, although there are a lighting system into the cave from above, flanked by a perforated window on either sides, you may need torch light or candles for better light and observe the interior structure of several small niches which were hewn from the cliff wall for individual practice of meditation. Local people believe that the cave was built during the 13th century for the locals to hide from the invading Mongols. After your exploration of Kyauk Gu U Min, return to the boat for a relaxing cruise down as well as enjoy sunset while to Bagan. Upon arrival at jetty, transfer back to your hotel. After breakfast this morning, transfer to the airport for the flight to Yangon. Yangon, formerly capital of Myanmar and known as Rangoon, planned and built by the British after the second Anglo-Burmese war in mid-19 century. Therefore,city is full of impressive colonial and different spiritual heritage,making it one of the most fascinating cities in Southeast Asia. Today Yangon is still remaining as commercial city although the authority moved administration capital to Nyi Pyi Taw in 2005. Upon arrival, your guide and driver will pick you up at the airport. Continue your tour venture downtown to explore the city centre for historical buildings and city life of Yangonites. First photo stop in front of the city hall, Maha bandoola garden and Independence Monument, then walk to Sule stupa in the middle of the city which is believe to be zero point of Yangon, afterwards continue your walking tour passing through many faded colonial and historic buildings. Then visit Little India and Chinatown, a colorful cacophony of restaurants, temples and markets. Finally,end the walking tour at Bogyoke Market, formerly known as Scott’s Market, the old locomotive factory as well till 1926.Variety of local products and imported goods are available at your choice. (Note: Market is closed on Mondays and public holidays). After the market, continue the tour to Shwedagon Pagoda, the most revered Buddhist temple in Myanmar. Most Buddhist devotees believe that it was built in the time of Lord Gotama Buddha;more than 2500 years ago, although the origin of the pagoda is unclear. The Pagoda has been renovated several times before taking its current shape in the 15th century. The 76.5 carets diamond on top, More than 80 thousand pieces of different Gems studded and offered at the spire; more than three tons of gold leaf gilded central stupa is about 100 metres tall, surrounded by 64 smaller stupas at the upper plat form. Transfer to the international airport for your onward international flight.